If you’ve been following New Breed over the last few months, then you already know we are huge fans of HubSpot. We attended Inbound 2012, a 3-day conference in Cambridge jam-packed with networking, presentations, and breakthrough information, all focused on our newest marketing service, Inbound Marketing. Part of the inbound marketing package is embracing marketing automation platforms. And HubSpot is one of the best. It’s an innovative and powerful marketing automation platform, that revolutionizes the concept of inbound marketing, and is especially successful when it comes to capturing, and following up with leads. But what if you want to capture leads outside of HubSpot? Meaning that you want your leads to funnel into your marketing automation platform, but you don’t want to (or can’t) use a HubSpot landing page to actually capture those leads. What if your website is on a different platform? Or what if a partner site allows you to setup a landing page on their domain? Login to your HubSpot account and choose “Add New Page”. Give the page a meaningful name like “Outside Forms” so you can find it again for future use. After saving changes, choose to view the new page and then click “Add Module”. Choose “Form”, give it a name, and choose “Save” with the “-Create New Form-” option selected. When done, hit “Save Changes to Form” so you don’t accidentally lose your work. Choose a page to redirect your users to after they successfully complete your new form. You could simply redirect them to your homepage, but best practice is to setup an actual “Thank You” page so you don’t confuse your users, and in some cases you’ll want to allow the user to download content on that “Thank You” page. Also having a bona fide “Thank You” page lets you do additional user behavior tracking. You will now be shown a window that contains the generated form code. Select the entire snippet and copy it to your clipboard. Now you can paste this code snippet ANYWHERE you’d like the HubSpot form to appear (similar to how embedding YouTube videos works). That’s it! 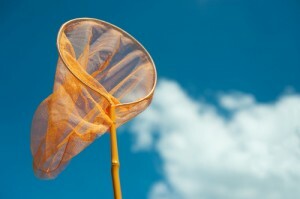 You now have an easy way to capture leads outside of HubSpot. 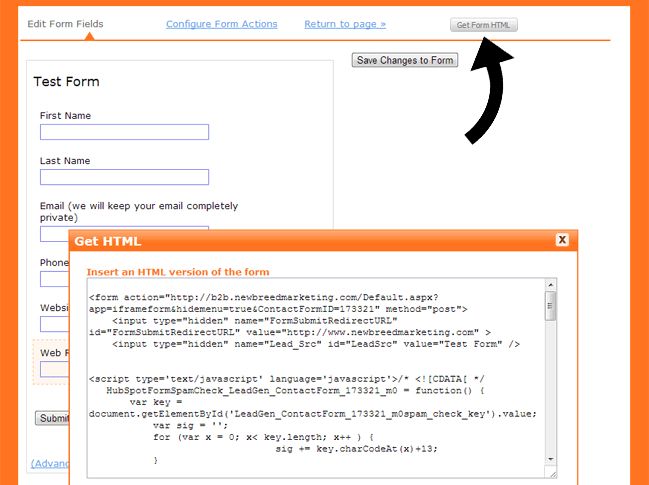 With these quick and simple steps, you’ll now be able to integrate HubSpot into any pages you are creating on the web. And stay tuned because HubSpot is slated to release their new form creation tool very soon, and you know we’ll be blogging about it! Patrick Biddiscombe is the CEO of New Breed. He also spearheads our Revenue department and his background and skills in sales and inbound strategy has contributed immensely to the success of New Breed and our customers' growth.